USC’s opening game of the 2014-15 season was supposed to showcase the beginning of the program’s turnaround under Andy Enfield. 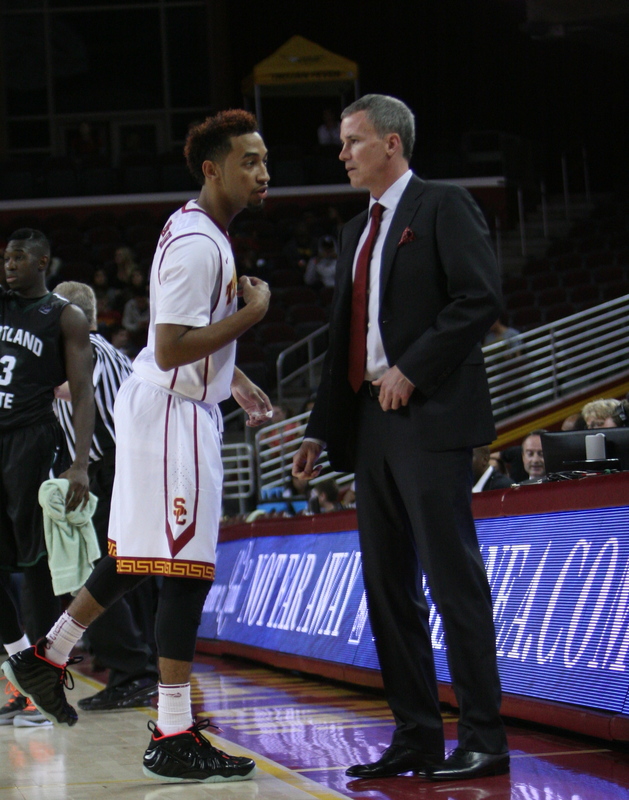 Instead, Enfield dropped to 0-2 in season openers as USC’s coach, after the Trojans lost 76-68 to Portland State. With USC having such a young team, this is not the negative morale boost the Trojans needed so early in the season. Additionally, this performance by USC reminded fans of the nightmares of years past, rather than show fans what to expect in the future. USC shot 53.2 percent from the field, while Portland State shot only 39.1 percent. The Trojans outrebounded the Vikings 43-25. The reason why USC lost the game can be explained in one word: turnovers. USC had 23 turnovers, while Portland State only had four. The Vikings capitalized by scoring 31 points off of those turnovers. USC’s turnover percentage on all of its possessions tonight was 32.5 percent, which was the seventh-worst mark out of the 259 Division 1 teams that played this weekend. The lack of turnovers forced on defense could be an even bigger problem. USC forced a turnover on 5.7 percent of Portland State’s possessions, the lowest percentage out of all 259 Division 1 teams that played this weekend. USC’s players need to be better decision makers on offense, and the coaches need to come up with a better plan for forcing turnovers on defense. Double-teaming Portland State was not effective tonight. USC not employing a press defense earlier in the game was head-scratching too. Yes, McLaughlin did have six turnovers. He had a debut, however, that showed why USC is so giddy about his future. I mean, USC unretired the #11 jersey just to give it to this guy. And in his first game, he put up 19 points. McLaughlin was the first USC freshman to score at least 10 points in his debut since Maurice Jones and Bryce Jones in 2010. He made two three-point shots, drove in the paint effortlessly and distributed it well to his teammates. McLaughlin led the team in scoring, assists, blocks and steals. The fact that McLaughlin already has the ability to create his own shot and help create teammates’ shots is scary. He has a natural feel for the game. It wouldn’t be unrealistic to expect a freshman to lead the Trojans in scoring and assists this season. 1. USC had won its last six home openers, a streak that was broken by tonight’s loss. The last home opener the Trojans lost was in 2008 at the hands of Mercer. 2. Fellow freshman Malik Martin also had a very solid debut. He scored 10 points and had six rebounds in just 22 minutes of playing time. McLaughlin and Martin combined for 19 of the team’s first 25 points. 3. USC did not have a single one of its shots blocked tonight by Portland State. 4. Portland State was a 10-point underdog and the point total was 154. So USC is 0-1 against the spread this season, and the UNDER is 1-0. 5. USC’s next game is Monday night at 8 p.m. against Tennessee Tech at the Galen Center.